I had a motorcycle accident in 2002 which left me with my left leg 40mm shorter than it's original design. The hospital threatened me with one of those "Ilizarov" frames to stretch my shortened thigh bone (femur) and return my leg to the correct length. Yet after 7 months I was back on my feet, back behind the wheel and finally back behind bars...bike bars. The idea of having a monstrosity of a frame on my thigh for between 4 months and a year seemed horrific when all I really required was a "big shoe"
So now I have my footwear altered by the application of a super-thick sole to the bottom of the footwear. Remarkably it is incredibly rare for anyone to notice I have any deformity at all. I find I have no trouble walking and after a little practice I find I have but the slightest of hassle changing gear with my super-thick soled boots. I don't consider my limb length discrepancy to be a problem in my life. My boots. You can easily see what needs to be done. Except for one thing. 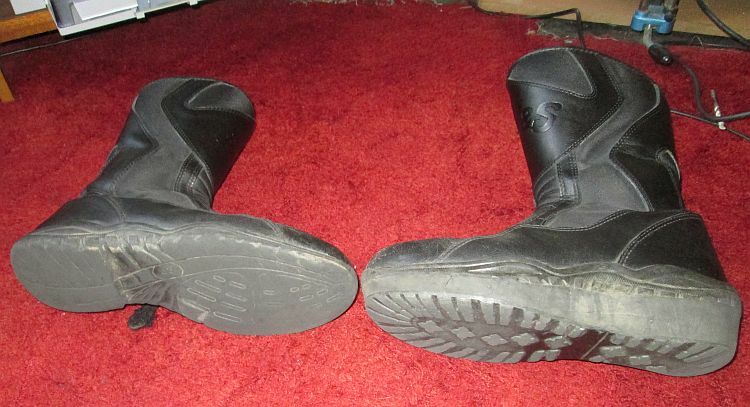 Waterproof bike boots. I do not believe there is such a thing as waterproof leather. I know cows don't leak, but they do sweat. As such leather is not watertight. You can treat leather with dubbin and various other products and this stops light rain and walking through damp grass from getting in. But...BUT it does not prevent 300 miles of torrential rain being forced into the leather at 60 mph. One treatment might stop this for a day, but if I'm riding day in day out on a trip for 2 weeks this treatment will have faded, disappeared and given up after so many long soakings. No, the only really waterproof material is rubber. Modern boots are fitted with a layer of waterproof membrane, the quality items use Goretex, I hear some riders swear blind their XYZ boots have been totally waterproof over a 25,000 mile round the world trip. Ooooh, thinks I, I've got to get me some of those! I sidle into various motorcycle shops and salesmen espouse the waterproof merits of their top-of-the-range models with much gusto. This always seems to be accompanied by a tale of how they or their friend or the shop mechanic has had a pair for 5 years and they've never seen a wet sock ever since. Yep...that's the boot for me that is. £350! Yikes! But, but if I want dry feet for the next 3 years I have to pay the price. Cheap boots leak, I know this I've been through enough pairs. "OK Mr Salesman, do you guarantee that if my sock gets wet in the next 3 years that I can bring these boots back and you will replace them?" Typically the answer is no, only 1 year warranty is offered. Hmmm, not for £350 mate. Some marques will put their money where their mouth is though. "Yes sir, if you get wet sock syndrome in 3 years we will replace these boots, that is how confident the manufacturer is." "Great! Ah, oh, hang on. Look at my boot Mr Salesman. I'm afraid to say I'll have to have a big super-thick sole added to the bottom of the boot. Don't worry, it's only glued on to the bottom of the existing tread, it won't affect the construction of the boot itself." The new super thick sole is just glued in place by a cobbler. "Oh, oh dear, we can't send that back to the manufacturers for replacement. Sorry. But sir, believe me, they will not leak!" "You, Mr Salesman, are asking me to gamble £350 on your say-so. Either put your trust in your product or shut up." "I can't warranty them if you bring them back like that, but be assured they won't leak." "I choose not to take your word on this if you're not prepared to back it up." That conversation has been had quite a few times. I actually like to bait salesmen into this conversation just to see what happens, I guess I can be a real git at times. As such I continue to buy cheap boots on the premise I'm not expecting them to be waterproof. What I would like to happen is for a manufacturer to read this and prove me wrong. I am not a wealthy man but if someone out there truly believes their boot is waterproof, and will remain waterproof for a sensible period of time then I am prepared to spend the money and have dry feet. 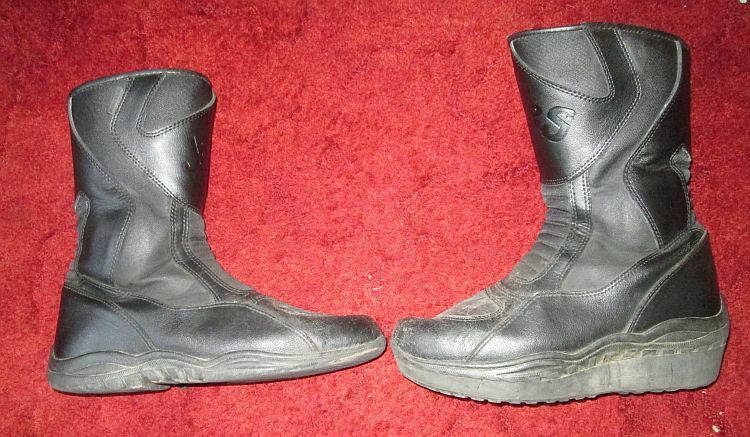 I will need to have my super-thick sole added to the boot otherwise walking, hanging around with my biker friends and generally using the boot is uncomfortable for me. Hi Juanita. I regret to inform you I've tried the Sealskinz. I purchased a pair a couple of years ago for one of our French trips and was all excited by the notion of dry feet no matter what boots I was wearing. Unfortunately...they did not work at all. I think the problem is manufacturer's definition of waterproof. If you're wearing Sealskinz under your walking boots and happen to walk through some wet grass and a little gets through the leather they'll probably keep your feet dry. However when riding through a deluge some bike boots end up like just having your feet in a bucket of water. The Sealskinz weren't up to this. Plastic bags are the only really waterproof item I've found so far. They don't last very long but at least they're cheap. They can make your feet sweat so much though that they end up as wet as not having them on. Whiffy skanky feet can be an issue too if you use them a lot. Eeeewwww.